How can any respectable darts journalist pass up the opportunity to comment on tomorrow night’s mega-reprise of the good old Leonard-Hearns-Hagler days of the 1980s? OKAY, so I’m not particularly respectable, at least according to women. But I do know a little something about darts, at least according to me. Not long ago, somebody asked why I’m so passionate about our sport. I remember almost exactly what I said: I am captivated by the purity, the “sweet science” of darts – the paradox of simplicity and complexity, the mix of power and precision, strategy and mental strength. The battle – and make no mistake about it, the sport of darts is nothing less, whether between two professionals on stage, under the lights, in front of the camera, or between two buddies in the back corner of a neighborhood bar – is exhausting, exhilarating and beautifully addictive. The hoopla that’s led up to this fight reminds me of the posturing that preceded Phil Taylor’s 21-10 leg drubbing of Raymond van Barneveld in the so-called “Match of the Century” at Wembley Conference Centre in 1999. My mind harkens back to 2004 when Taylor again stepped to the line for a grudge match, this time against Andy Fordham – who was unable to meet the bell at the beginning of the eighth set. 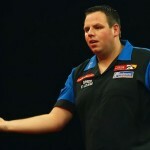 These big time darts confrontations bear more than just a mix of “power and precision” similarity with the fight game. For example, as most darts insiders know, it wasn’t so long ago that Fordham was the WDC Flyweight Champion. Of course, everyone – including many ballroom dance aficionados who wish they were blind – knows of “Pretty Boy” Mayweather. With a record of 38-0 (24 KOs), the three time national Golden Gloves champion, 1996 Olympic bronze medalist, current Super Welterweight Champion, winner of six world titles in five different divisions and Ring Magazine’s selection for 26 months running as the best pound-for pound boxer on the planet, it comes as no surprise – particularly to Mayweather – that he’s who most, but certainly not all, the smart money is on. “The fight won’t go the distance, I can promise you that,” says Mayweather. “I respect what (“Sugar” Ray) Robinson and Ali did for the sport, but I am the greatest and this is my time.” Yes, the quiet and unassuming Mayweather is a bit of an Eric Bristow clone – a “braggart with bling” wrote FOX Sports’ Mark Kriegel. But also like Bristow in his heyday, and Ali, Mayweather gets the job done, often before he steps into the ring. 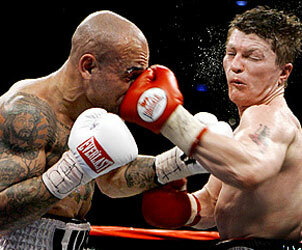 Then there is Manchester’s “Hitman” Hatton with his equally untarnished 43-0 (32 KOs) record. Widely hailed as one of the greatest British boxers ever, Hatton was Ring’s 2005 Fighter of the Year (and is also ranked among the best pound-for-pound fighters in the world. Twice he’s held the IBF and IBO Light Welterweight titles and he’s a former WBA Welterweight Champion. 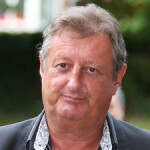 Not unlike Mayweather, Hatton also shares something in common with Bristow – just as Bristow was awarded an MBE for services to sport in 1989, Hatton received the honor earlier this year. Considered the biggest welterweight fight since 1999 when Oscar De La Hoya fought with his feet instead of his gloves and lost a majority decision to the straight right hands Felix Trinidad, tickets to “Undefeated” sold out in thirty minutes. Forty-eight hours before the bell VIP floor seats were being auctioned for $3,000 at eBay. This is the short answer to why when yet another darts-boxing connection, three time world champion John Lowe (who damn well ought to be awarded an MBE) contacted me about meeting up at the fight, I begged off and ordered HBO Pay-Per-View instead. But there are more darts connections. It’s well known that thirteen time world champion Phil Taylor and Hatton are mates. Less well known is that Hatton is more than just a fan of Taylor’s and darts. Hatton actually throws in a league back home out of the New Inn in Stockport, Manchester. Between training sessions in Las Vegas he and his entourage have been spotted at the Crown & Anchor Pub – and Hatton’s been pounding the sisal. Yes, he’s more than just a fan of our sport; he’s a player and he takes it seriously. Mayweather, like Ali, has the longer reach and is a smart and tactical fighter with the “fastest hands in boxing” and “unusual” defensive skills. He’s a boxer who dances and uses the ring. He ain’t easy to hit. Heralded more for his accuracy than his power, I think of him as a doubles man. Give him a shot at the d20 and you’re not likely to get another trip to the line. Hatton, like Frazier, is a worker, a fighter with a devastating left hook who bores in, plants his head on his opponent’s shoulder and mauls them, brawls them, tires them and then drops them. From the opening “game on” bell he’s a relentless “one-hundred-and-eighty” man who not once in his career has given his opponent a shot at the double. It’s gonna be a hell of a fight. I’ll be watching with my dog and a six-pack. The “smart” money may be on Mayweather but mine is on the arrows man. June 29, 2005 Column #187 Adrian Lewis Was Screwed!! 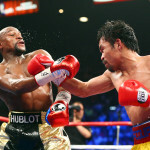 May 5, 2015 Column #488 Floyd Mayweather – the greatest of all time?